The resident then called Dona Forbes, whose name and Social Security number was on some of the documents. Forbes was not alone, scores of others had sensitive personal information on the documents that were stuffed into the dumpster. All of the files were marked with Doran Reality, a company in south St. Louis County that Forbes did business with nearly 20 years ago. 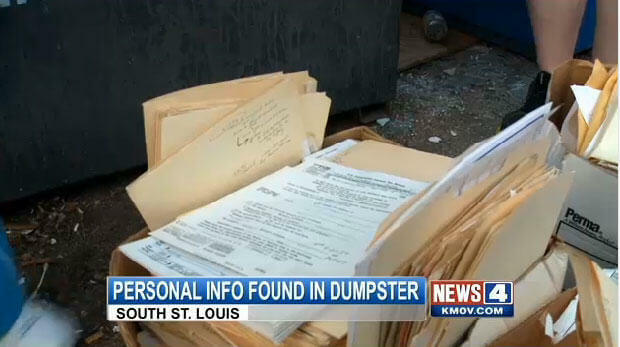 “This information you thought was going to be safely filed away ended up in a dumpster. It was kind of frightening. You felt invaded and intimidated,” Forbes said. Sunday night, Forbes and her husband dug through the documents, some of which dated back to 1989, in an effort to pick out documents belonging to them and destroy them. The Forbes’ tried to call St. Louis Police but were told nothing could be done unless they brought all the documents to the police station. News 4 later learned Doran Reality is no longer in business. Authorities said it is not a crime to carelessly toss out documents that have someone’s Social Security number on them, even if it makes it easy for thieves to steal personal information. 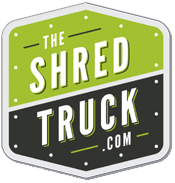 A shredding company later pledged to pick up the dumpster and destroy any documents with sensitive personal information. The Forbes’ said they may lobby for legislation that would make such careless dumping illegal.